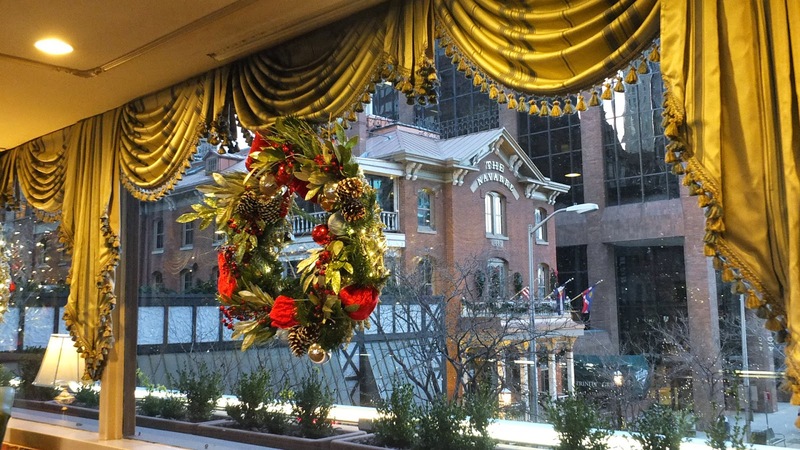 So hard to believe that this year is almost over and this is the last weekend before Christmas. It will be 2015 before we know it. Got in one last weekend of treasure hunting before the year ends and found some nifty pieces at my favorite haunts. 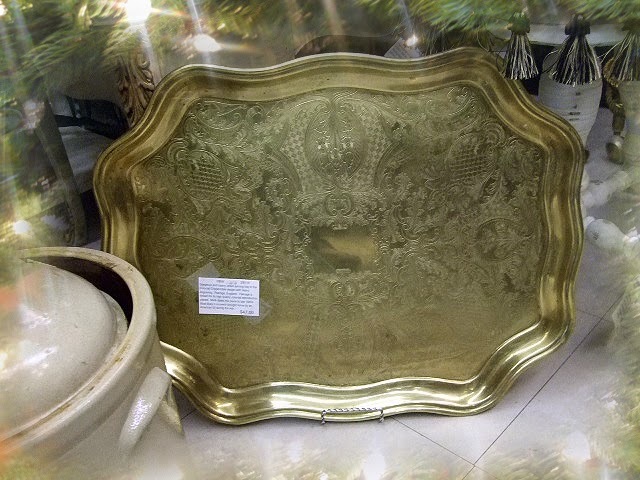 I picked this, late Victorian shaving mirror, up about 5 years ago at a local thrift store and it hung in my entryway for years. 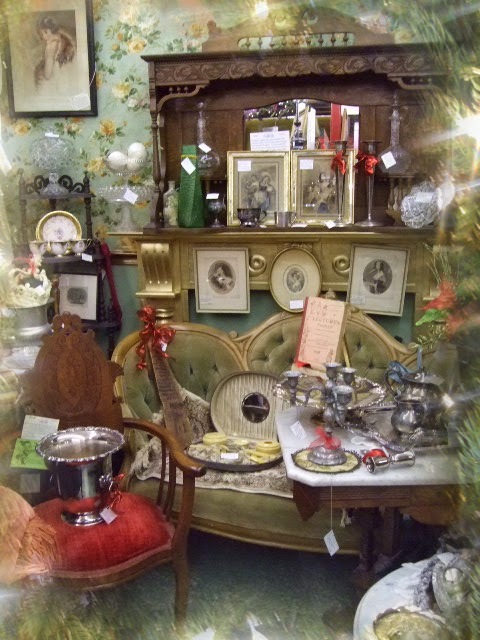 It's now time to move it on so it is in my Victorian booth at the Buford Queen of Hearts. Beautiful, French steel engraving, depicting a woman deciding on what jewelry to purchase, drawn by E. J. Parris,and engraved by J. Thomson. Date 1844. Hand colored with original matting. Elegant reframe, 1940s. 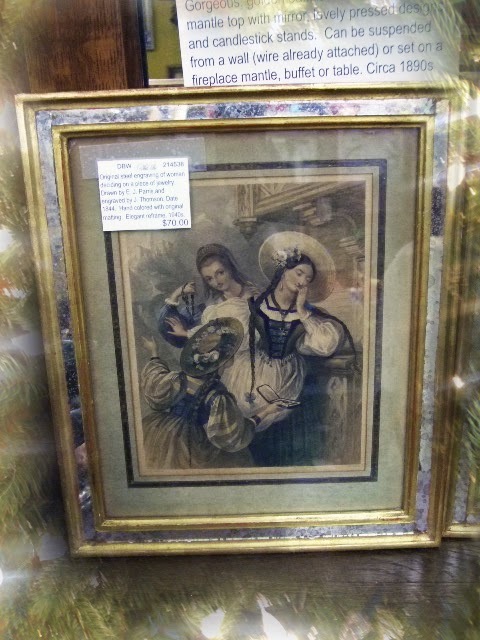 Beautiful, French steel engraving, "The Bridal Eve," drawn by E. J. Parris,and engraved by J. Thomson. Date 1844. Hand colored with original matting. Elegant reframe, 1940s. Beautiful. 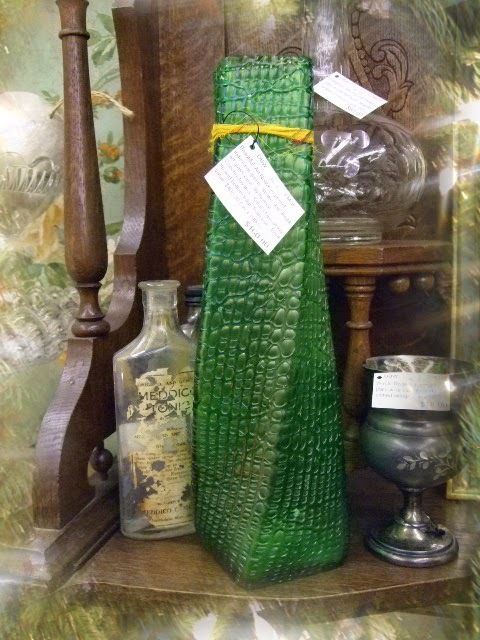 Art Nouveau period, iridescent green, “snake skin” Kralik, art glass vase. (Bohemia) Czechoslovakia. Small chips along lip and bottom edge from use. Circa 1900s. 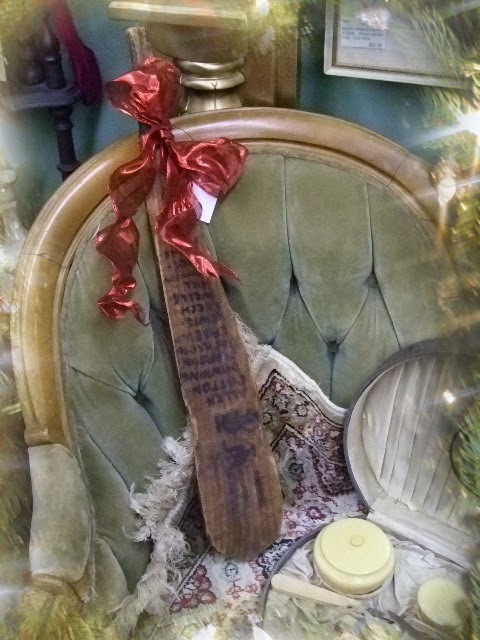 Circa 1900s, fraternity paddle. Xi Psi Phi Fraternity, was created in 1888, by five freshman dental students who were attending the University of Michigan to create a club among freshman dental students for intellectual and social interaction. This is a fun piece and would be a nifty gift for a dentist to put in their office. 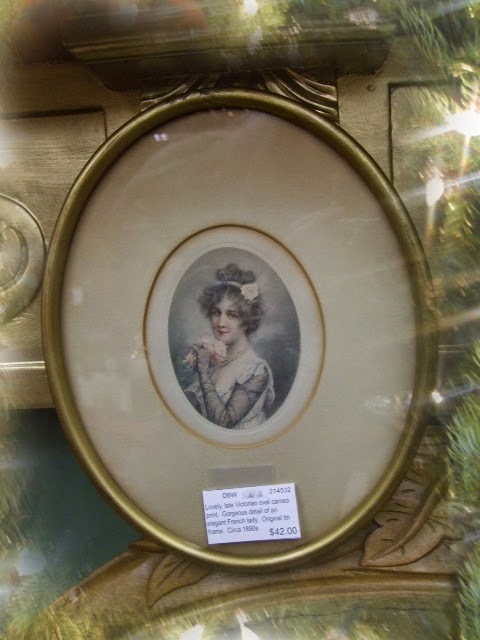 Lovely, late Victorian oval cameo print. Gorgeous detail of an elegant French lady. 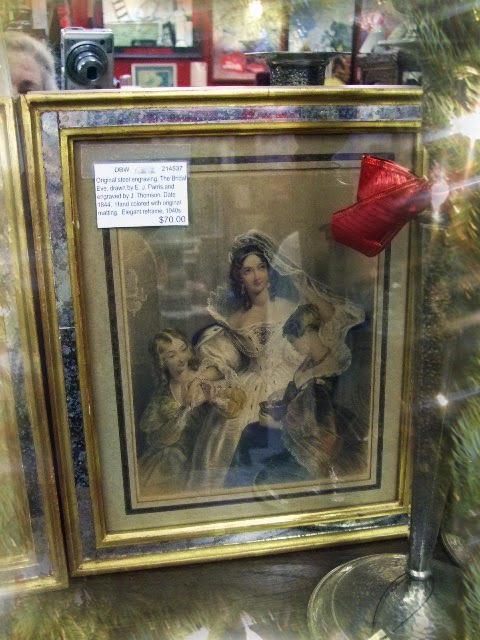 Original tin frame. Circa 1890s. This is such a pretty little print. Should have taken a pic of the easel without the book on it. 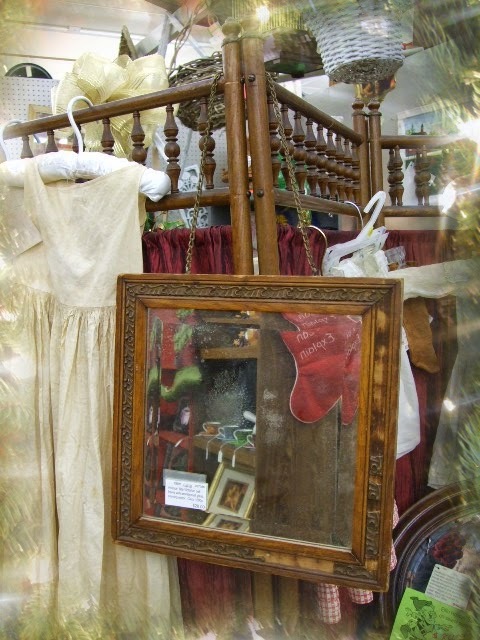 Pretty, Italian Florentine frame is a neat find and it is in my Victorian booth. 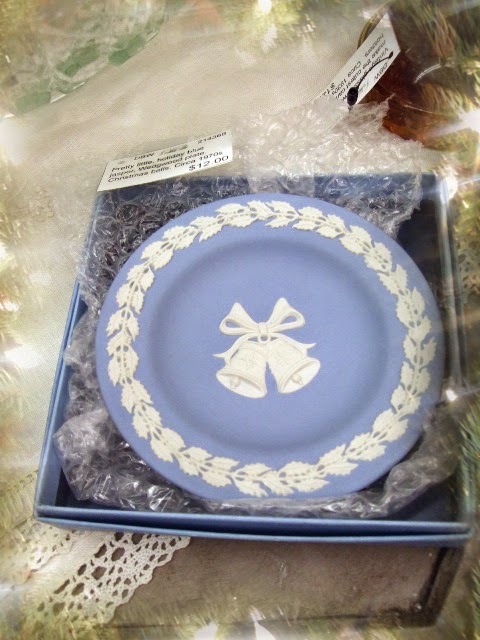 A Goodwill find, beautiful Wedgwood trinket plate in original box. 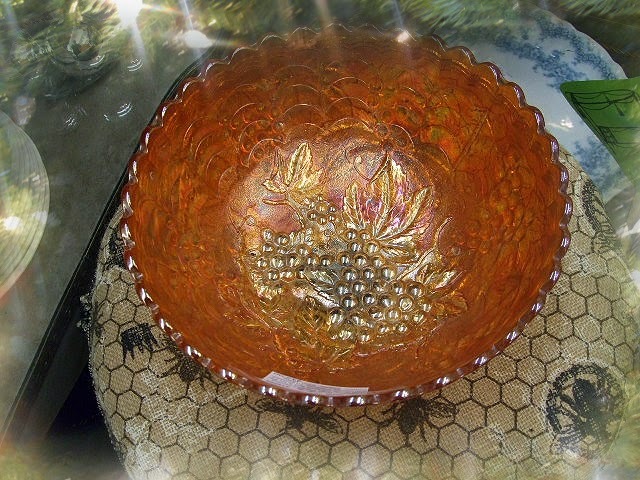 Smashing, large Imperial serving bowl of rich marigold that is on fire with orange brilliance. Tri pressed. Pattern: Grapes. Circa 1970s I have a matching smaller bowl as well. American GI during the war. 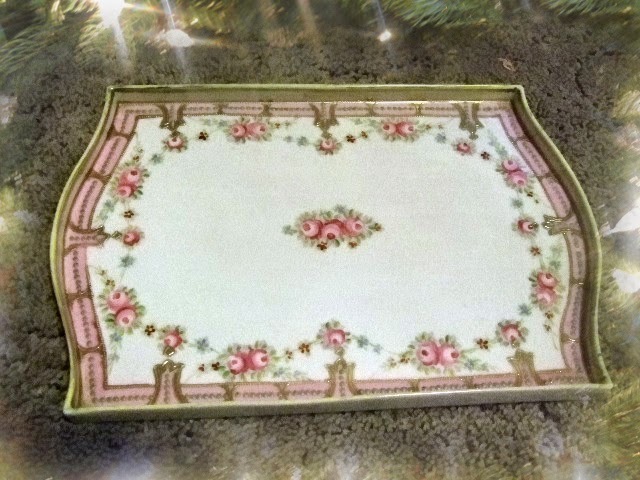 Pretty Nippon, hand painted vanity tray. Unusual edge with lip. This will be in my space for Valentines Day. My Victorian booth space got a refill this weekend. Lots to still find for your Christmas giving. My main space is also refilled. 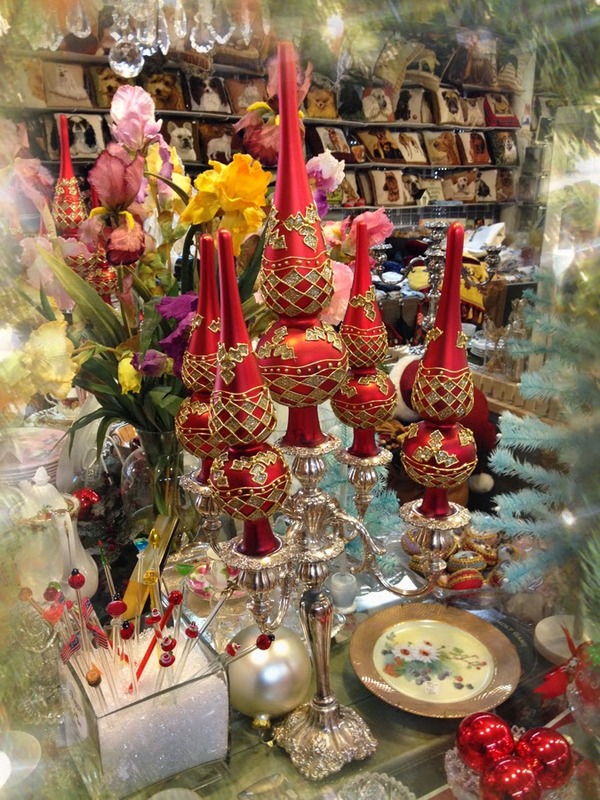 I have sold lots of Christmas decorative pieces so I will have very little to "pack up" when the holiday ends. I always like it when that happens. 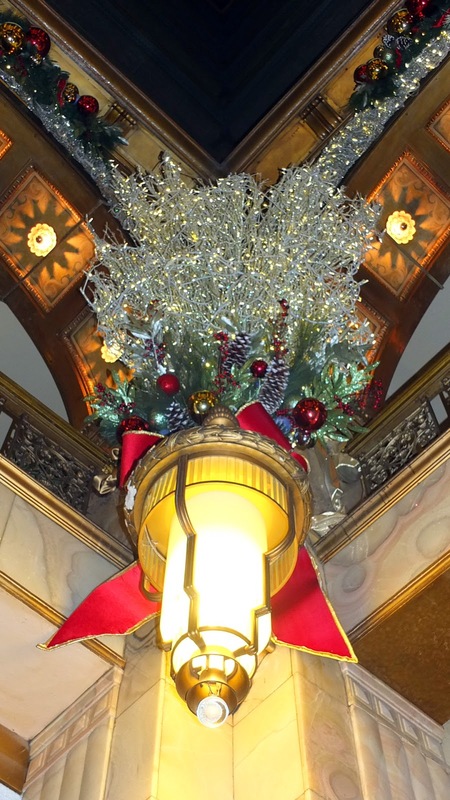 I'm already planning my post holiday displays, you have to stay ahead of the season. and then he handed me a million bucks. Let me start at the beginning. 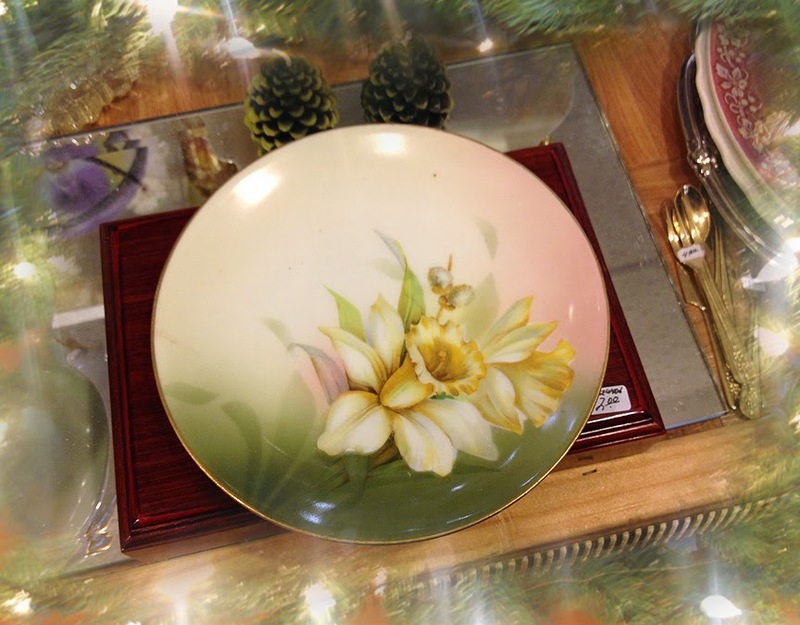 I was doing a little treasure hunting at a favorite haunt when I came across a set of Bavarian, daffodil dishes. Usually Cabbage Roses are the theme on these pieces but daffodils, not common. So I brought them to the counter where I had a small pile forming. I was at the far end of the shop when a distinguished man approached me in a brilliant, Christmas red shirt. He asked if I was "need this" as that is how I am known by the owners. I concurred and he asked if he could purchase the daffodil plates from me. He shared that daffodils were his favorite flower and wanted to make an offer worth my while. 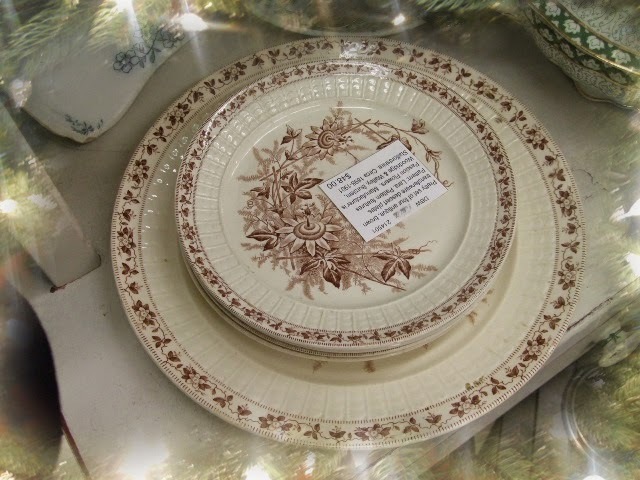 Well, it's Christmas, and sometimes we are the carrier for items, I said, absolutely not, you cannot pay me extra for these delightful plates. Let's just have the front desk move them from my pile into yours instead. Well, Stephan introduced himself and asked if he could give me a hug and then handed me a million dollars. 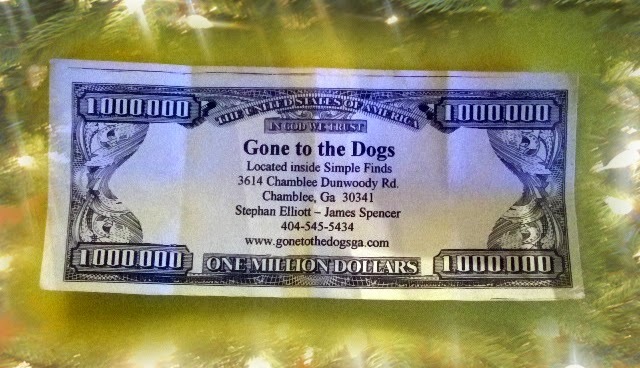 Seems that special bill was Stephan's calling card for the shop he owned called, "Gone to the Dogs." I was in the area so I decided to make a stop there. 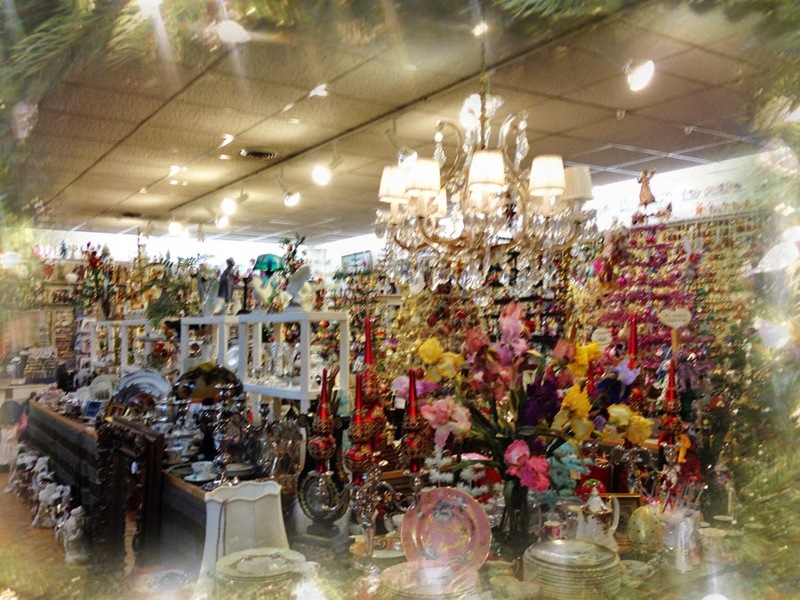 Gone to the Dogs is located inside "Simple Finds", a beautiful consignment shop housing gorgeous furniture, fur coats, jewelry, antiques and lighting. 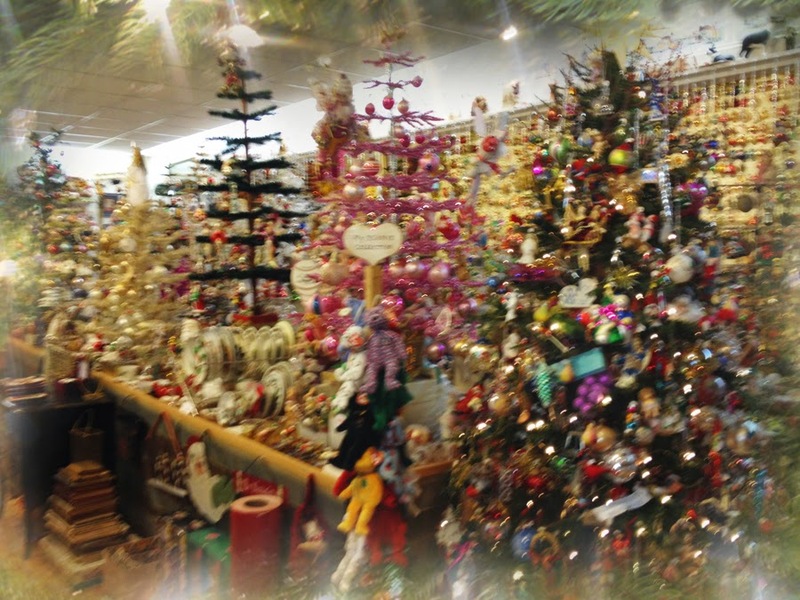 Not far from the entrance and to the left, you will find Gone to the Dogs and when you stand at the entrance, you will feel transformed into a Christmas ornament wonderland. 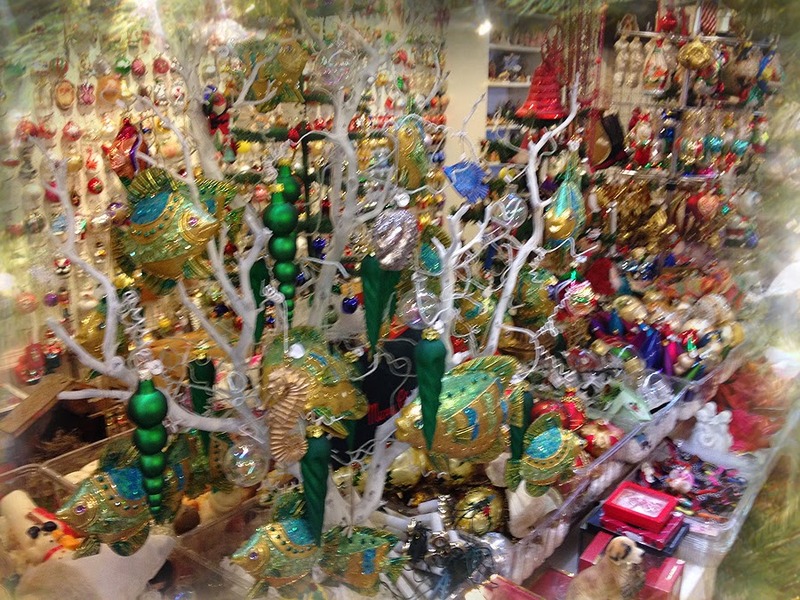 The color and the sparkle of the thousands of ornaments will leave you breathless. I truly stopped at the entrance to take it all in. 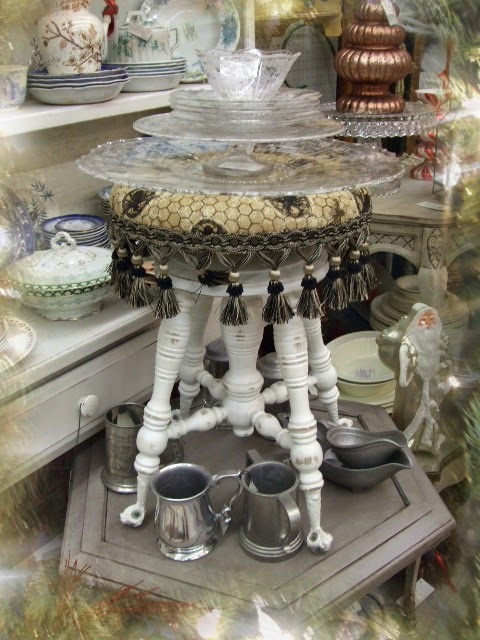 Beautiful antiques can be found through out. 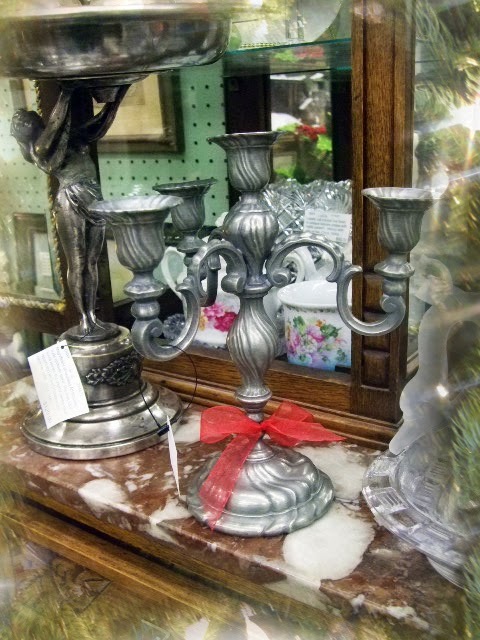 How clever to utilize glass tree toppers as candlesticks in this gorgeous silverplate candelabra. 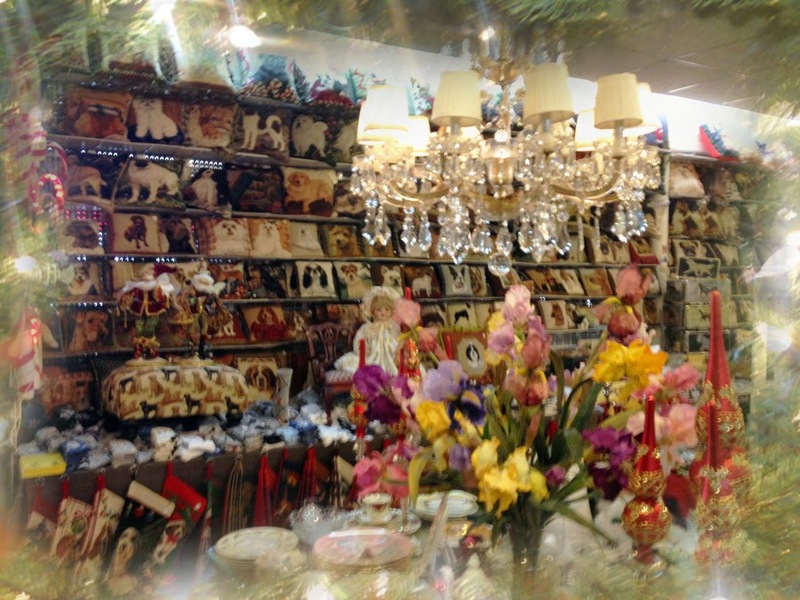 If you are looking for the dogs, well they are showcased the entire length of the wall and filled with needlepoint pillows, socks, hangers, pins, bows, and you name it and with every breed imaginable. Beautiful dog themed pieces. 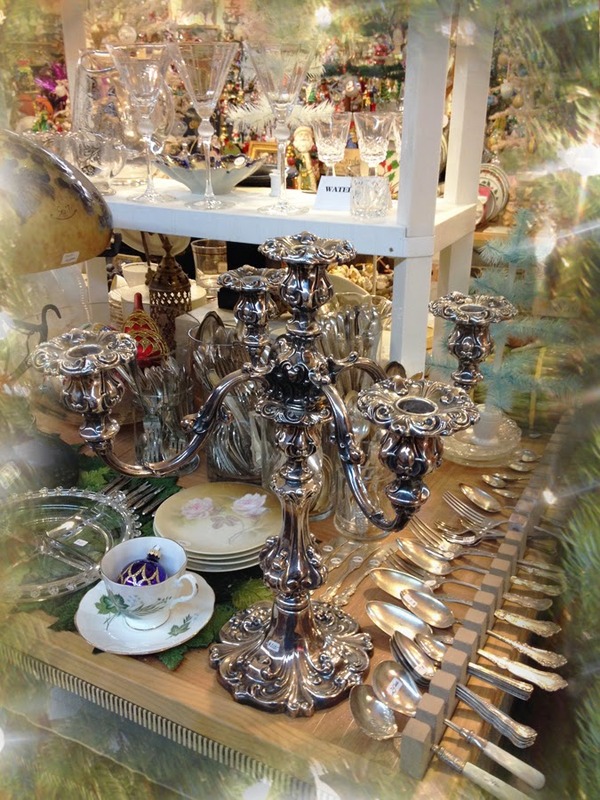 Fell in love with this magnificent candelabra. It is calling my name, I may need to start saving pennies for it. 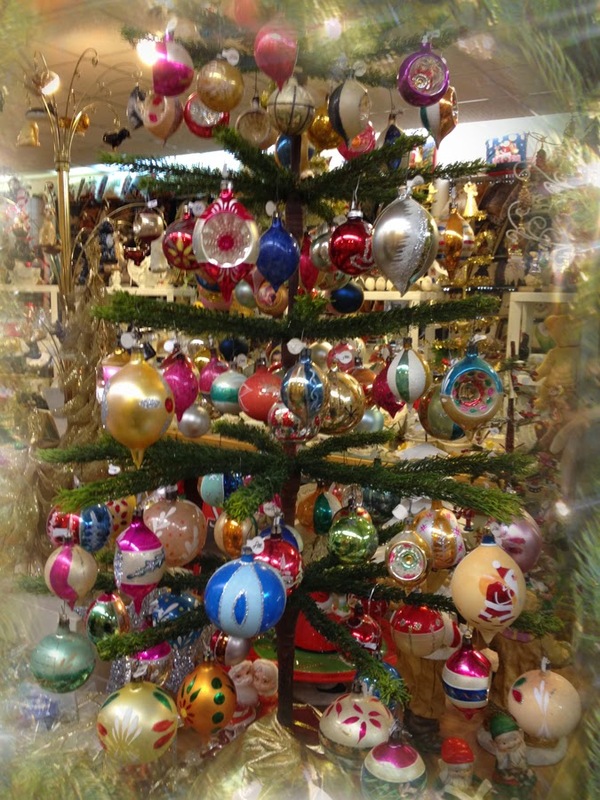 Tinsel trees, goosefeather look trees, vintage look and fir abound and all are filled to capacity with every imaginable ornament you could want and yards and yards of glass garland. 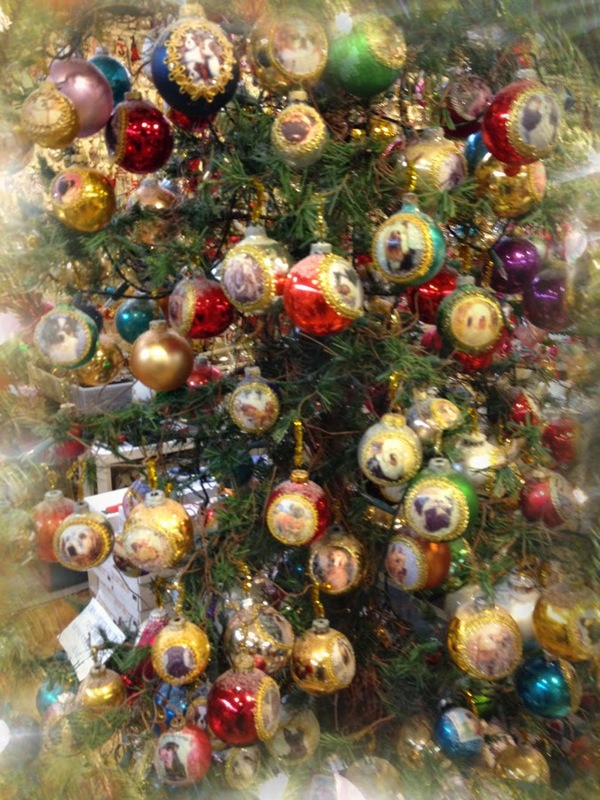 Stephan will take any photo you have of your favorite fur baby and turn the image into a Christmas ornament. 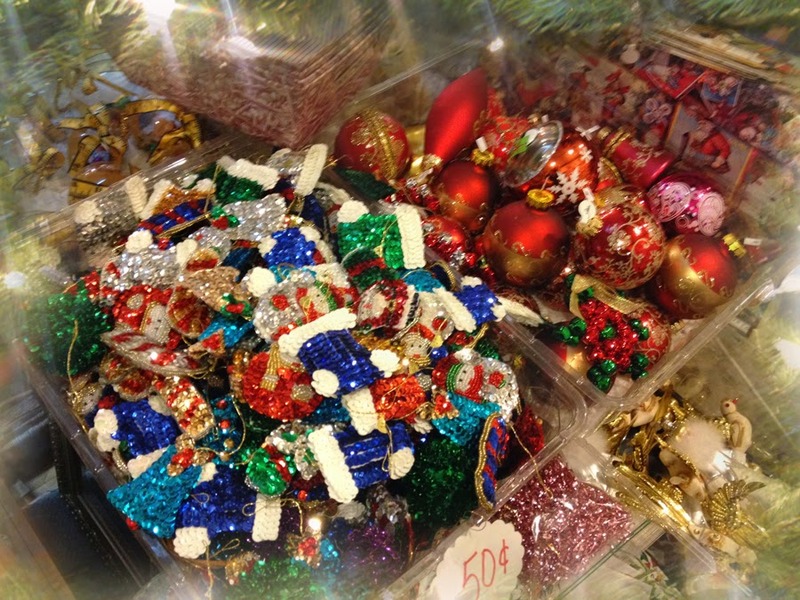 Sequined ornaments are perfect for little ones to put on the tree. They have the fire and sparkle that little ones love but will not break if dropped. Laughed out loud with this clever sign. 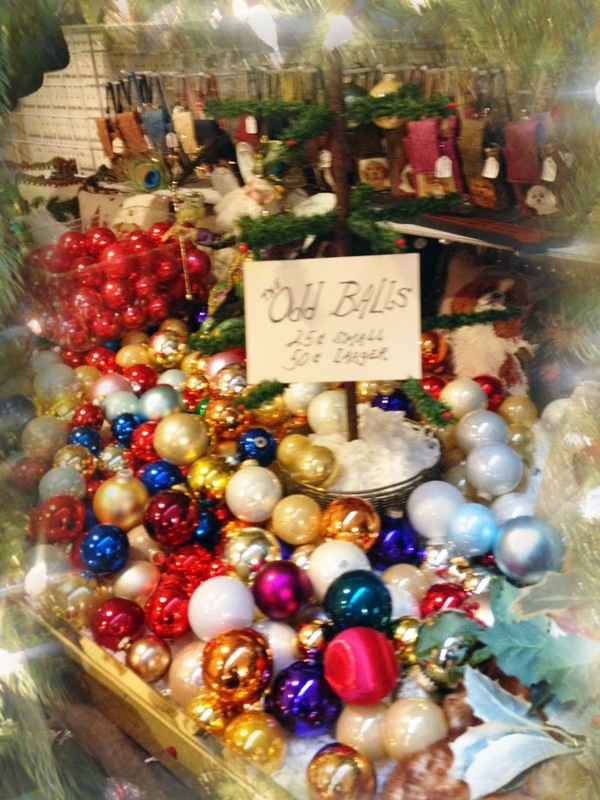 If you are looking for an "odd ball" you can't beat the price or the selection. 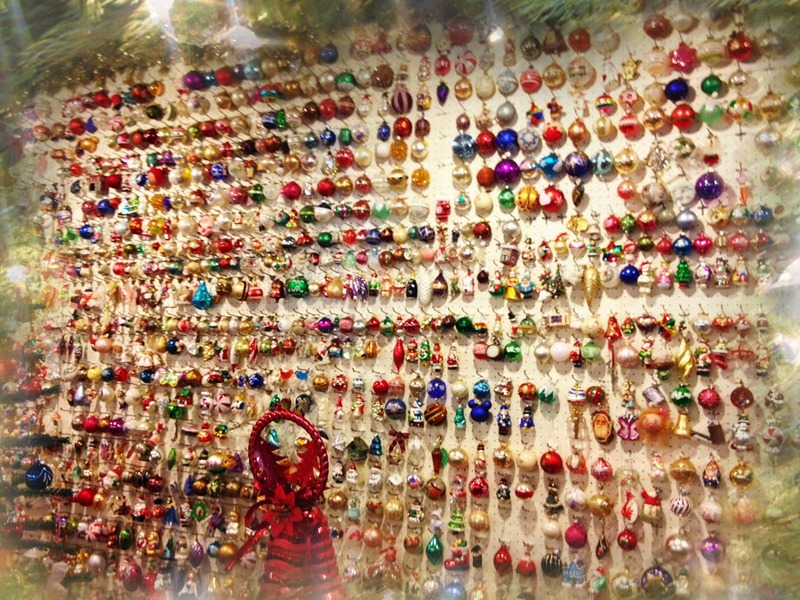 The wall of beautiful, glass ornaments reminded me of the German Christkindl Markets. 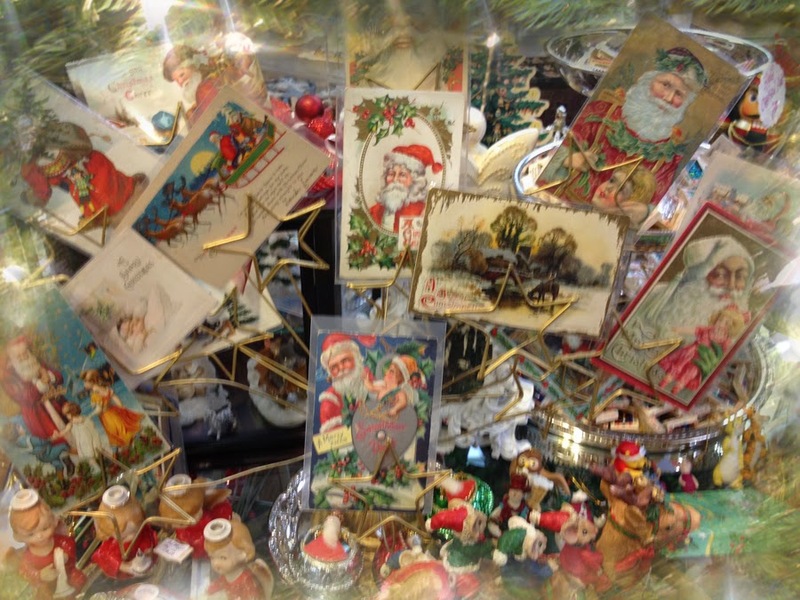 You will find the largest selection of vintage Christmas postcards I have ever seen. 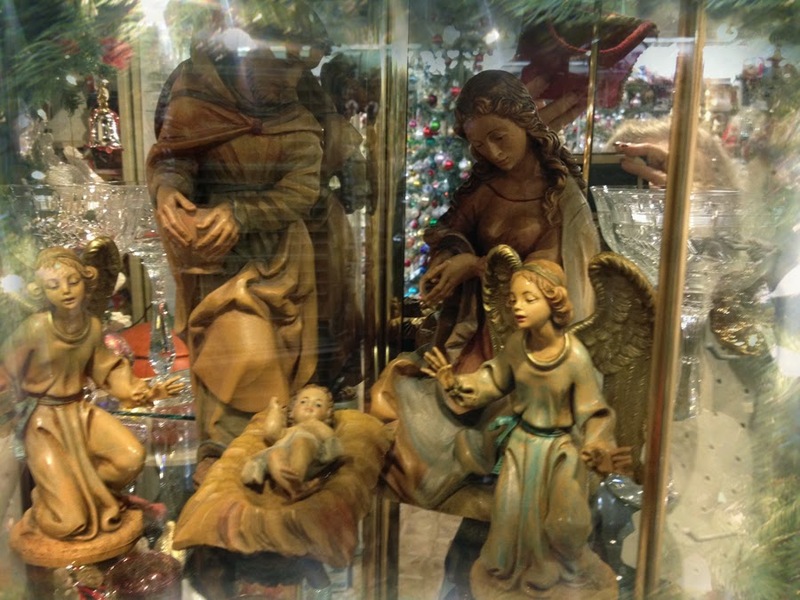 Beautiful Nativity scenes are in a large display case. 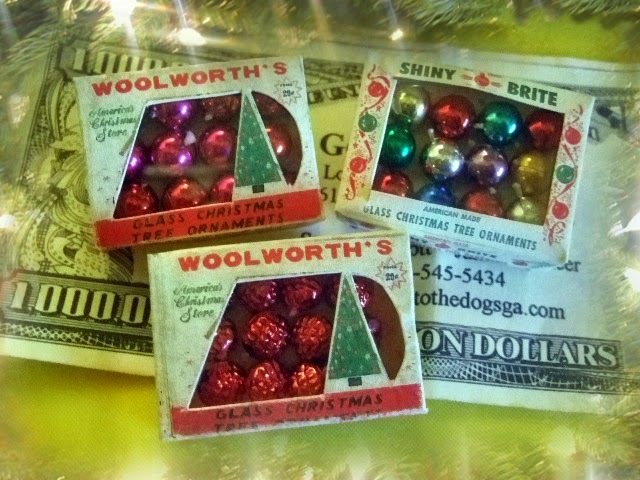 Nope, these are not vintage boxes of Shiny Brite ornaments but miniature versions lovingly handcrafted by Stephan. He has turned them in to delightful pins and all proceeds go to Animal Rescue. I bought three of them, one to send to my baby sister and two for me as I couldn't decide which I liked best. I'll be wearing mine through the Christmas season. 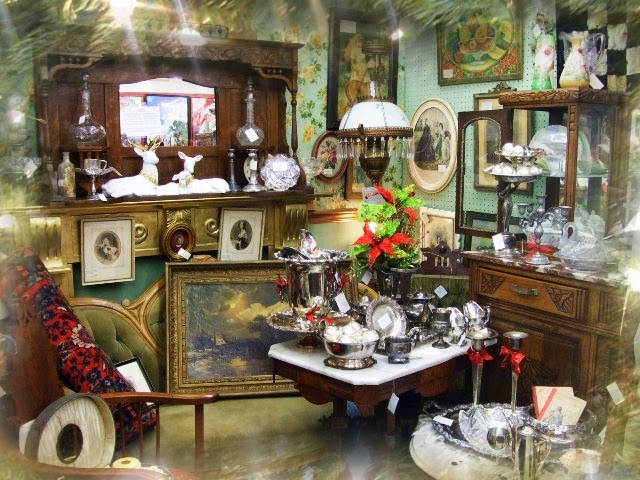 The antique business has afforded me the opportunity to meet the kindest and most interesting of people under so many different circumstances. I would never have known about Gone to the Dogs or have met Stephan had I not stumbled upon a set of daffodil plates at a local shop. In the words of my people, it was "bashert"... destiny or fate. Thanksgiving came and went and we are already entering the middle of December. I'm afraid to blink these days because January may be in my lap before I know it. Spent Thanksgiving week in Aurora, Colorado with my youngest son and his family. It was a perfect week with gorgeous weather. 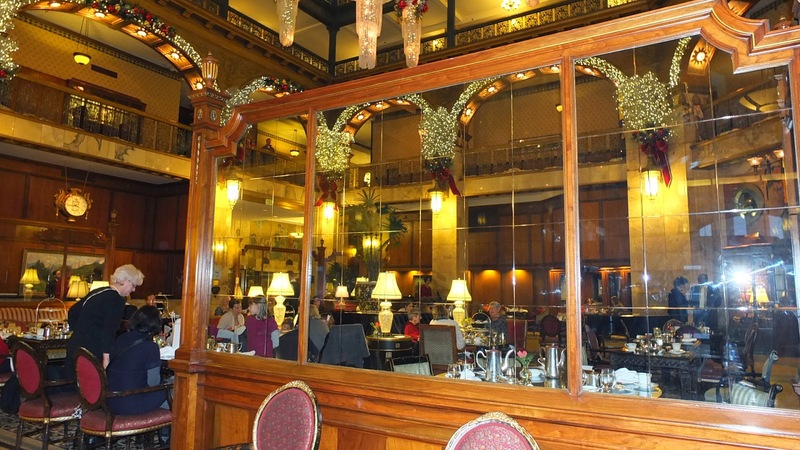 We walked around historical farm homes, had High Tea a the gorgeous Brown Palace Hotel in Denver, and family Thanksgiving in Golden. 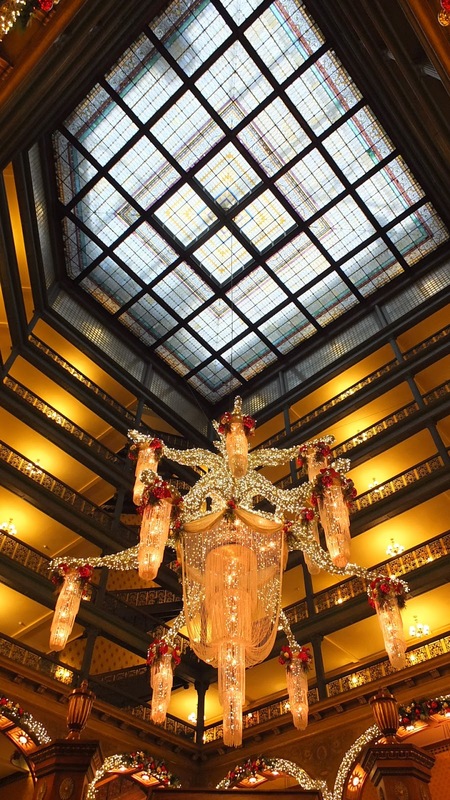 The beautiful chandelier in the atrium of the Brown Palace. This baby is huge. Every corner had highly decorated lanterns. 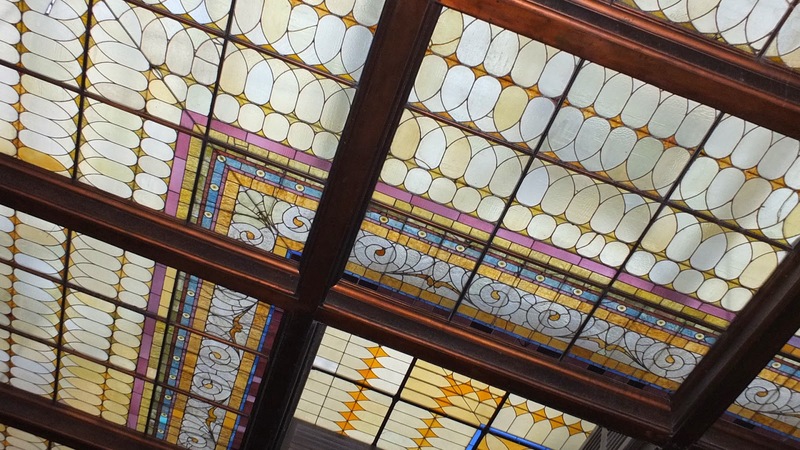 Closeup of the massive ceiling stained glass. Lots of folks enjoy Thanksgiving week High Teas. Looking out the walkway to the city. 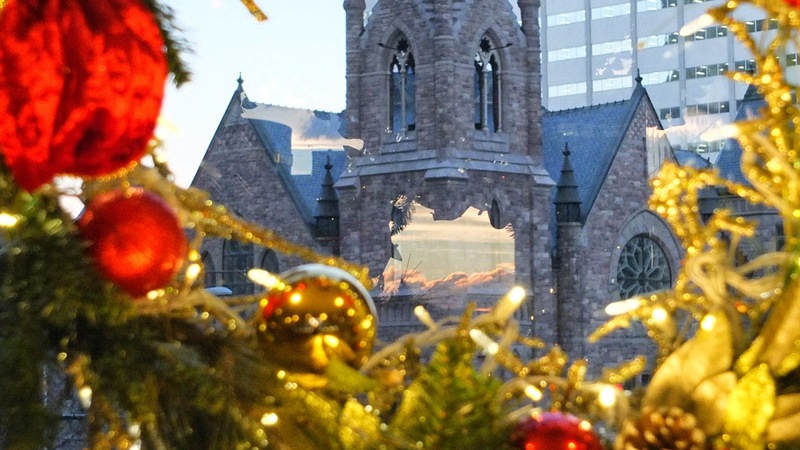 Reflection of the setting sun against the old church made for an interesting shot. 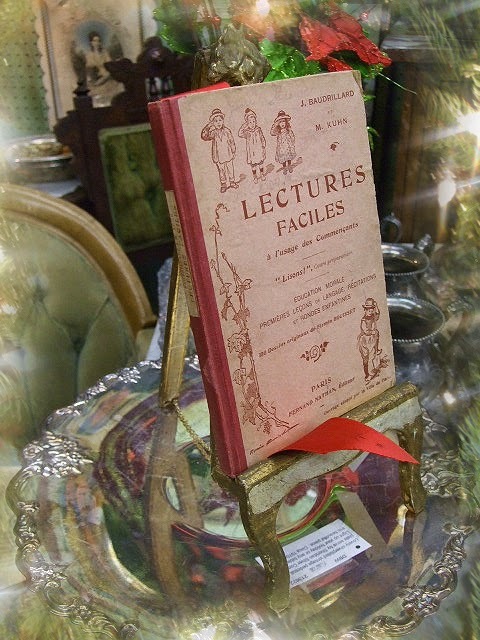 Now back home, I was fortunate to find treasure at a local auction and Vintage Village. 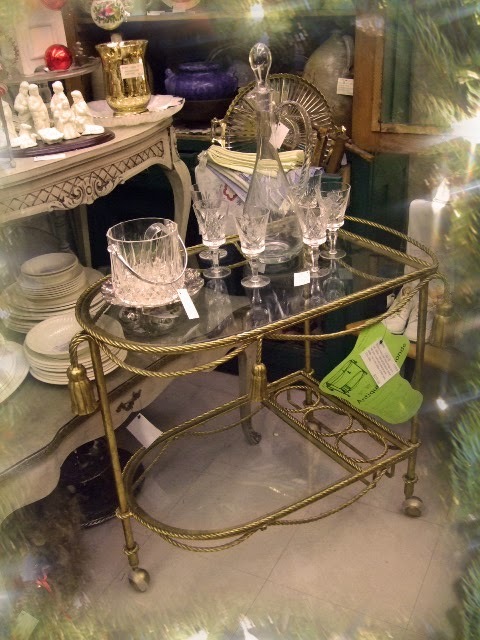 Stunning Italian gilt, wrought iron drink cart. Very heavy with a tassel design. Circa 1950s, this was an auction win. 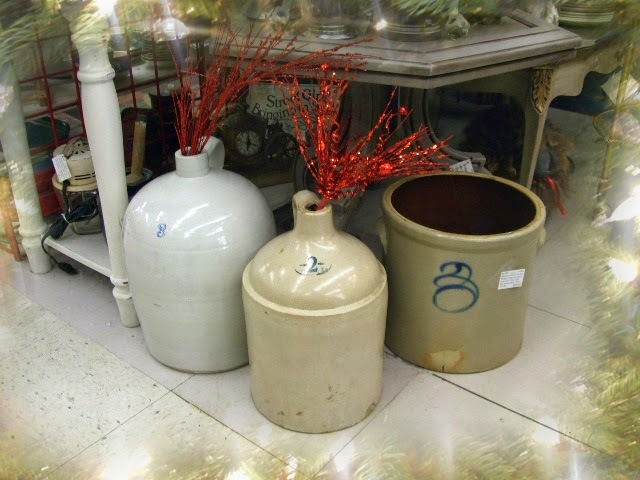 Three fantastic 19th century American whiskey jugs and a pickle crock. Perfect for the American Primitive collector. Love it when I find antique transfer ware. This set of plates is called Lara and from the late 1800s. 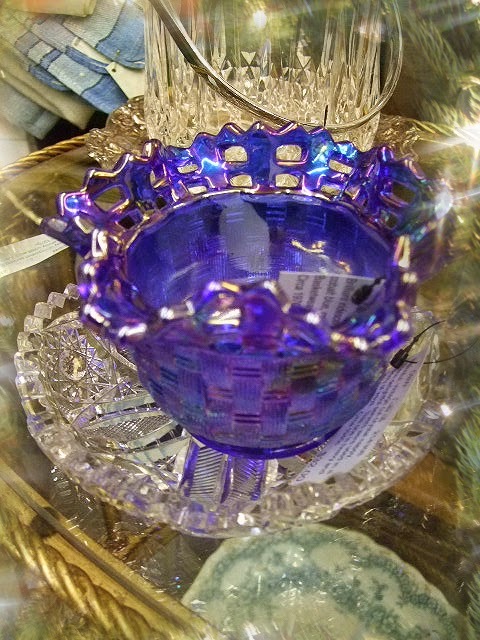 Pretty vintage Armetell Ware mugs and gravy boats and a great selection of Elegant Depression, etched crystal servers. 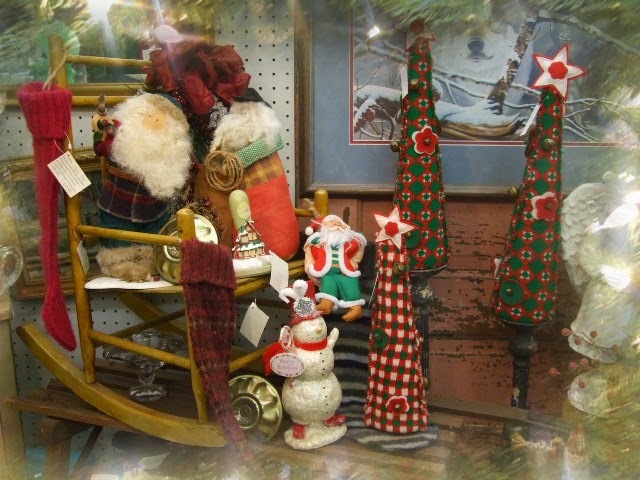 Festive Santas, snowmen and knitted trees have a homespun warmth. 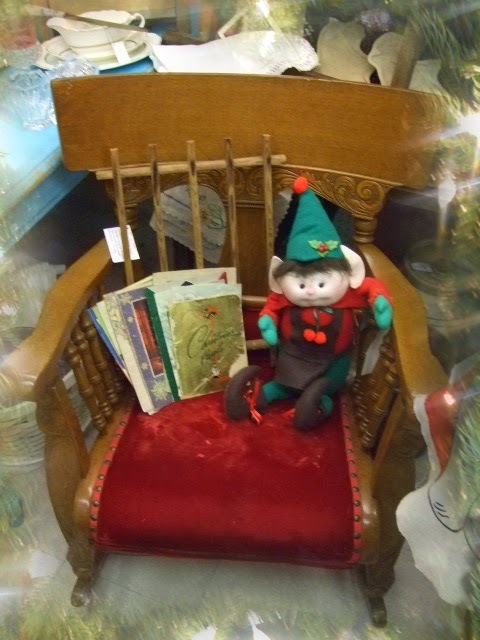 Sweet rocker with little elf is waiting to hand out caroling booklets. What is that wooden piece you may ask? It's a rare 1900s warming rack. 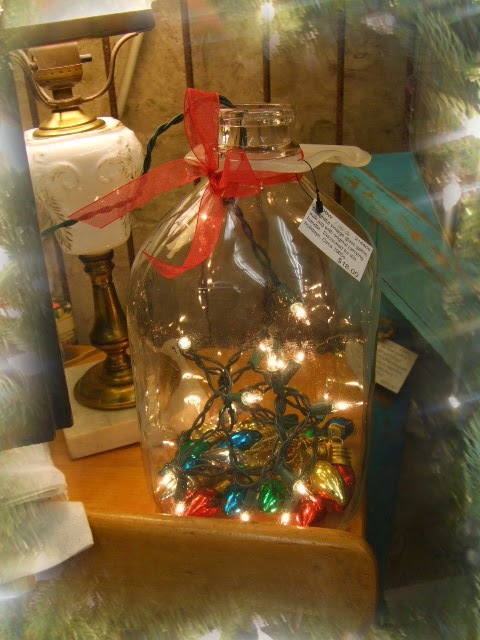 Filled this glass, gallon milk bottle with glass ornaments and white lights. 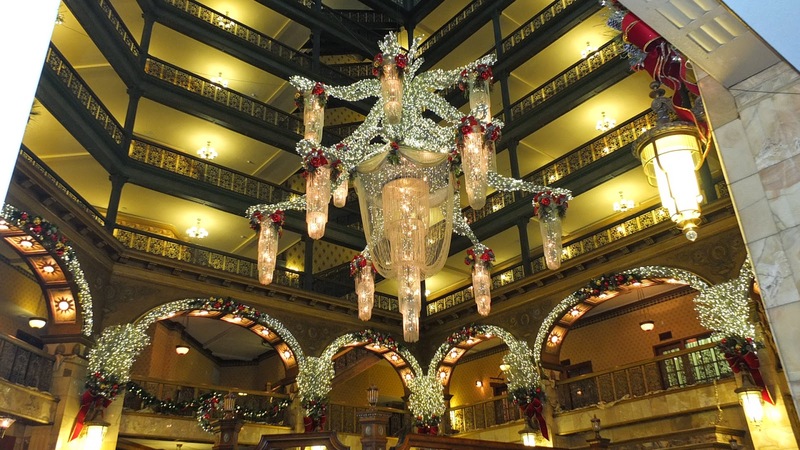 It makes a pretty Christmas light decoration. 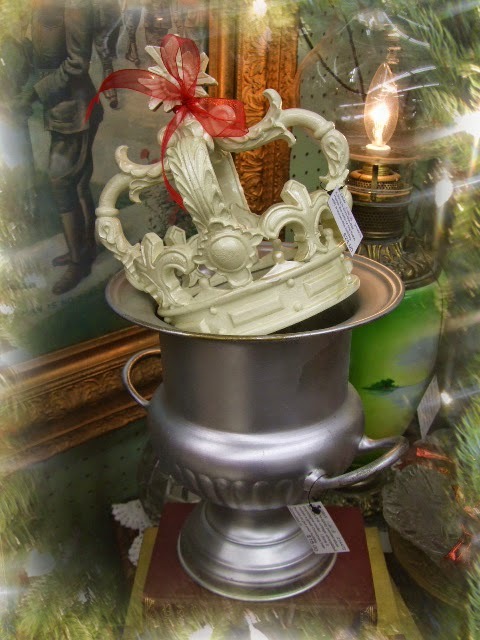 Honor the New Born King with a crown this season. Vintage champagne cooler was spraypainted silver by a previous owner. Would make a great stand for a favorite artificial tree. 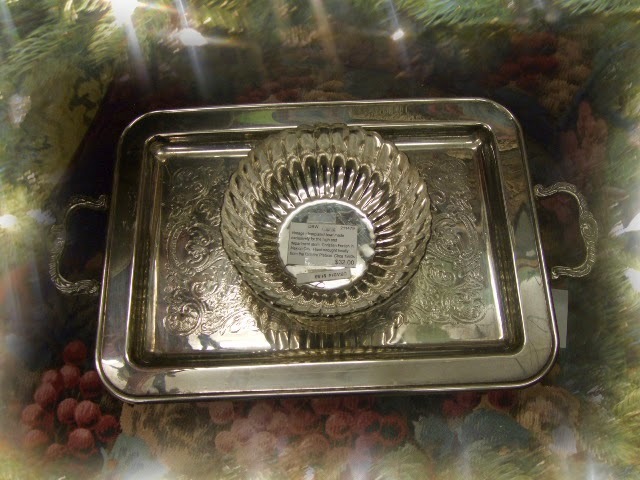 Sweet, small silverplated footed tray is too cute for words. 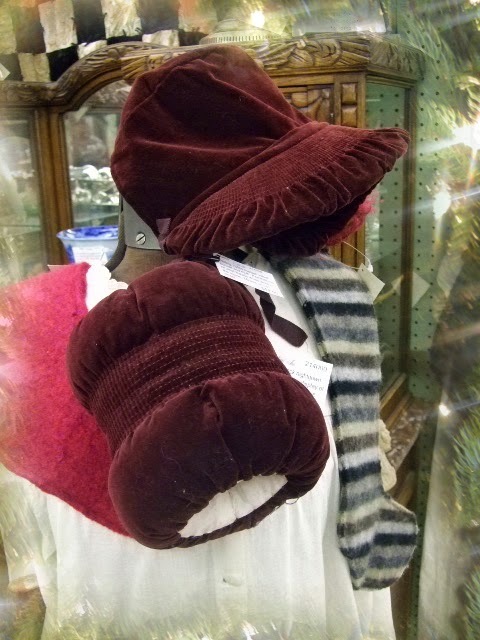 This vintage, child's velvet bonnet and muff remind me of what Natalie Wood, as a child, wore in Miracle on 34th street. 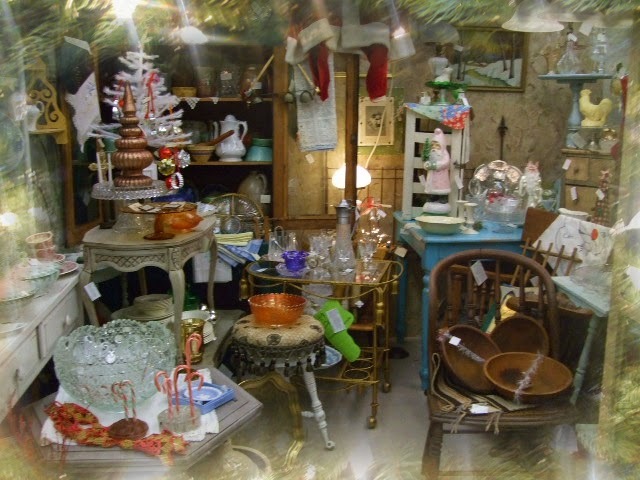 My main space is packed with Christmas decor and lots of gift ideas. 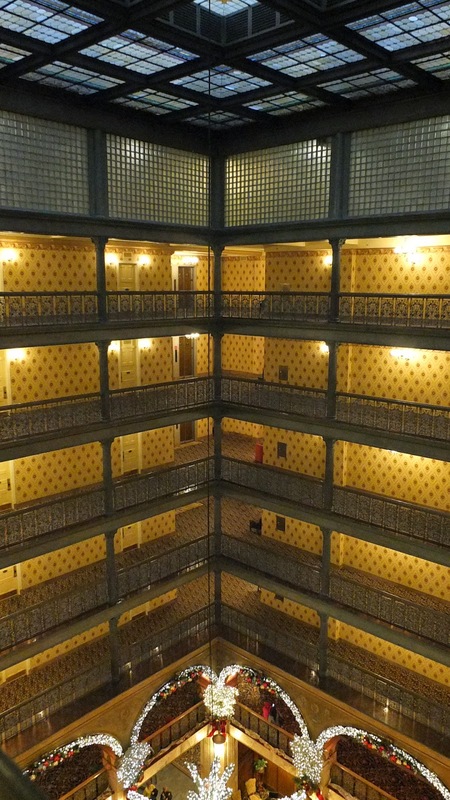 Victorian space looking pretty good too. 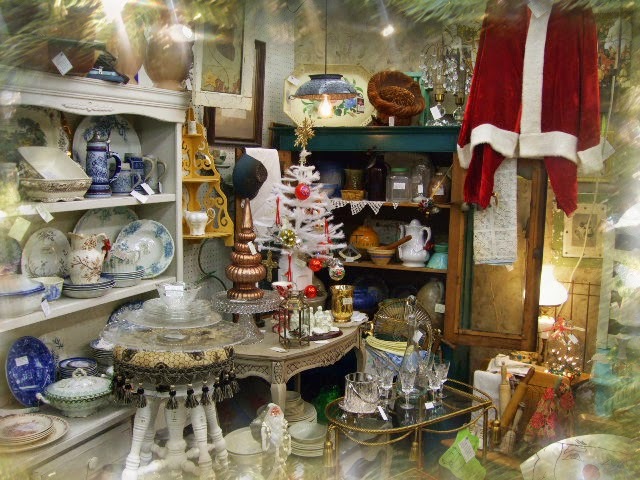 Now, a little Happy Christmas for me courtesy of one of the talented dealers at Vintage Village. Went to pick up a great Victorian rocker they were holding for me and so I did a little shopping as well. This box of vintage mercury glass bird were in their original box. I looked for the price tag, couldn't find one, but found this message on the back. "Sad Birds! The have lost their clips and tail feathers, but still so sweet. Free! (to a good Home)" OMG. Is this real? I brought the box to the front desk and YES, not only was it real but the dealer was there to confirm. Sweet! 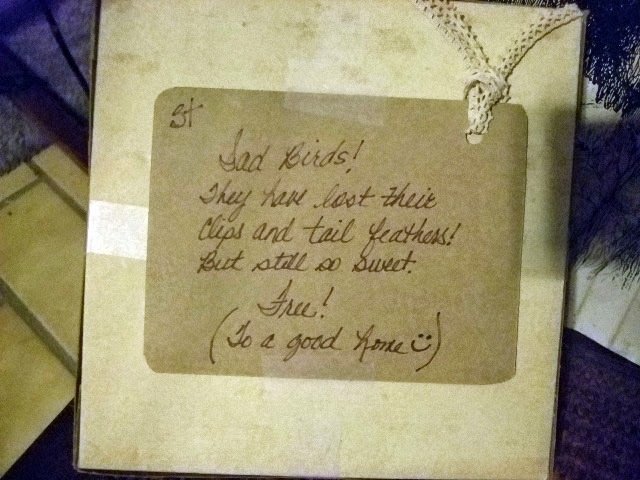 This is one of the many reasons why I so enjoy finding treasure at Vintage Village. 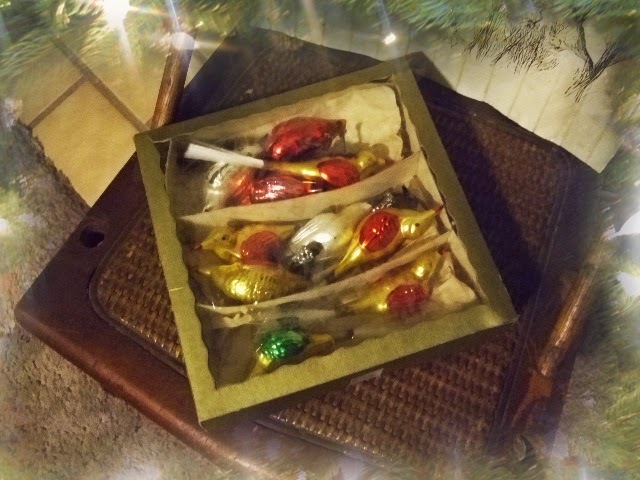 I went home with a free box of Christmas birds along with other treasure, life is good. 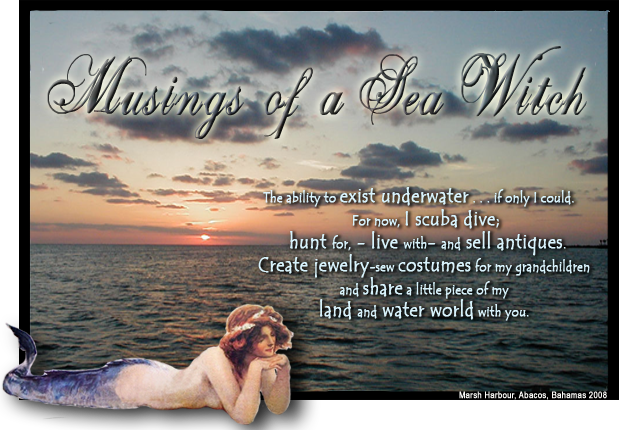 Translate Musings of a Sea Witch into your language. My needs are simple, my life is small but I had the love of a great man, still have the love of my two wonderful sons and their families, my beloved, late husband's children and their extended families and our animals. I live for the sea and I am at my best when in or near water. It is what sustains me. Am passionate about old things for their history and energy and am still collecting treasures since I was seven years old. Have bought, bartered and sold since 1988. I sell under the name, "I Need This Antiques." My husband always said I had oars in many seas as I love creating anything with my hands and will tackle any medium set before me. I have been blessed with much and adore all that has crossed my path. Thank you for stopping by my blog and remember to be excellent to each other. The one star flag represents my son who serves downrange for our country in this time of war. Keep safe and my prayers are with all of those who serve and their families. Gynness, my sweet rescue mini-doxie. FREE eye candy for the taking! "In the light of the Moon"
Christine Wallace... "Honoring Life Through Jewelry"
Say hello to my little friends!